So at the beginning of the month I made a little November wishlist of bits and pieces I either loved and wanted to show some appreciation too or bits which i really knew needed to be mine by the end of the month! 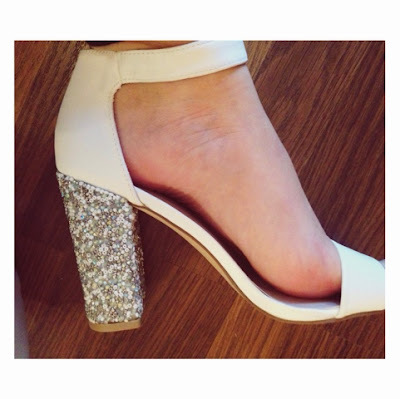 So here is now a little update of all bits I have collected over the last month and loveee. 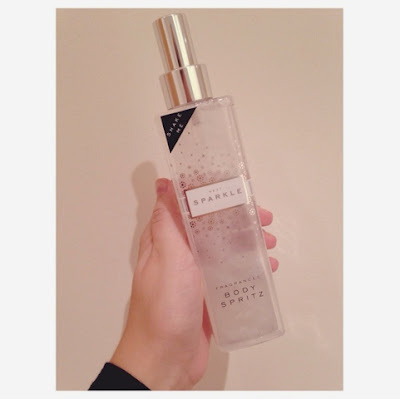 Firstly, this lovely body spritz spray from next which smells so beautiful! I actually went in to the shop for a gift for my friends birthday and loved these scents so much that i bought myself the silver one and her the gold one! The amazing thing about these sprays are that yes, they smell amazing but also if you shake them before you use them and then spray them on your body.. they leave a glittery shimmer on your clothes or skin. For this upcoming christmas season there is nothing better than glitter and sparkles so i think this is so perfect and cant wait to use it some more! This was a steal at only £5 as well, and comes in silver or gold so get yourselves one and it will finish off your christmas outfit perfectly! Its not the clearest photos but i think its really hard to show what a scarf looks like unless its on you! So this is one of my favourite things from November! 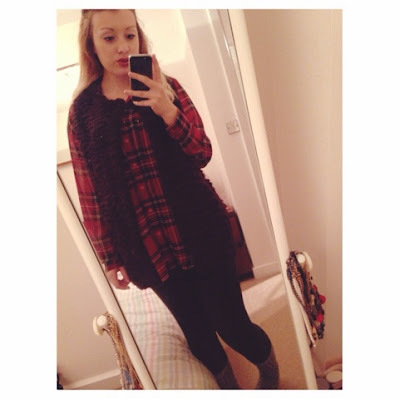 I am so in love with this Primark blanket scarf! 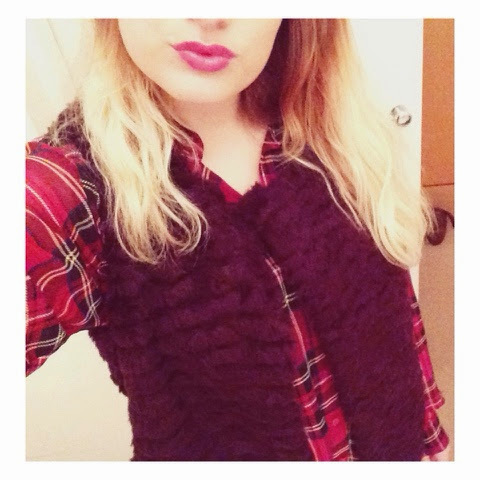 Its so warm and big and just perfect for this unpredictable chilly wear! Another bonus is that its tartan, which i am obsessed with. 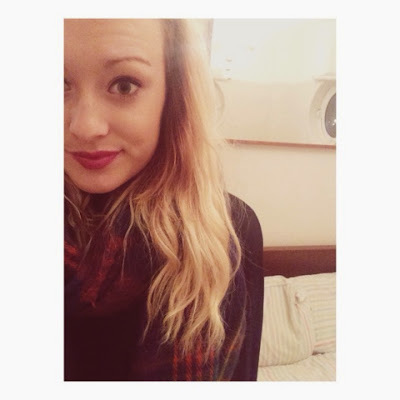 Every year i seem to get really attached to one scarf and ive got a feeling that this year its going to be this one! Also lets just take a moment to appreciate that this scarf cost £5!! Probablies the best bargain ive ever bought .. especially as in the past i have spent £20 on tartan scarves are a quarter the size of this one! So if you have read my recent blog posts you will see that i dedicated an entire post to this amazing purple faux fur gillet from Next! I am so in love with it, its my favourite colour and its fur so what more could i want?! Check out my recent post if you haven't already to see this beautiful piece in all its glory 'Purple Faux Fur'. 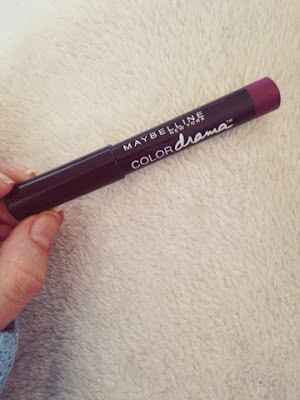 My favourite product this month is this Maybelline Colour drama lip pencil in a beautiful berry colour! 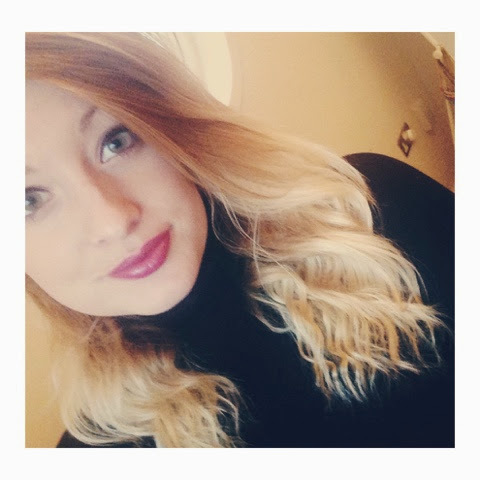 Berry lips are an absolute must for winter. I have been a fan of purple lips for a while now and wear them in this shade pretty much all of the time! What i love about this pencil is that it allows you to create a great shape for your lips but its also a lovely texture so its just perfect! I will definitely be buying more shades of these colour drama pencils, and at a steal of £5 you definitely cannot complain! 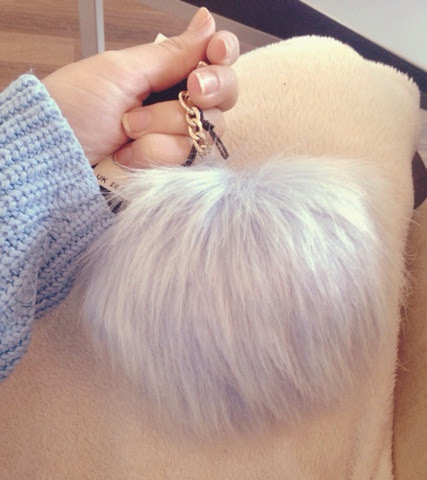 Okayyy so i finally did it and bought myself a fluffy pom pom keyring after umming and ahhing about it for ages! I have literally picked this up 3 times in river island and put it back down again because i just wasnt sure on which bag i would put it on! but i made the decision to buy it this month finally and decided on a couple of bags i can pop it on to style things up a little bit. This one is a gorgeous frosty blue colour and i dont know why but it really reminds me of snowballs and frozen for some reason! So to me its also quite christmassy! I loveee it! Cant wait to pop it on my bag and show it off. Fluffy pom pom key rings are a must at the moment and a perfect present for someone who is a fur lover! Get yourselves to river island and bag yourselves a fluffy treat for only £6!